Our weekly Advent series, "THE GIFTS OF CHRISTMAS", begins on Sunday, December 2nd at 10am. Join us each Sunday in December as we reflect on the significance of Christmas and sing carols each week. All of our Sunday services include a fully-staffed nursery and a fun program for kids grades JK-6 featuring danceable music, video-based lessons with skits and animation, crafts, activities, and discussion. Click here to learn more about what you can expect on your first visit to Arlington Woods. 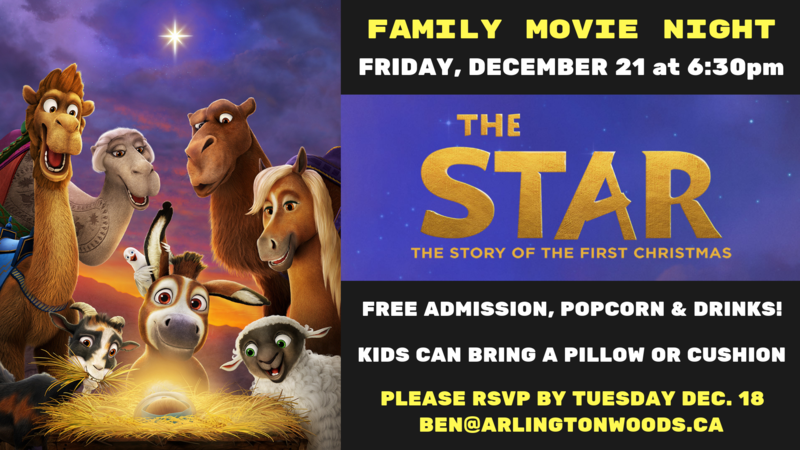 Family Movie Night- "The Star"
On Friday, December 21st we'll be having another Family Movie Night! "The Star" is a pretty fun re-telling of the Bible's Christmas story seen through the eyes of some animals who are trying to keep Mary and Joseph safe! There is no cost and the movie will begin at 6:30pm in our kids area downstairs (so arrive a couple of minutes early). There will also be free popcorn and drinks available! Kids are welcome to bring blankets or pillows to get comfy on the floor near the front of the screen, but we'll have lots of regular chairs as well. Please RSVP simply by emailing Pastor Ben at ben@arlingtonwoods.ca by Tuesday December 18th if you are planning on joining us. We would love to have you and your family join us for our Christmas Eve Candlelight Service happening on Monday, December 24th from 6-7pm. This is always a very special occasion as we reflect on the Christmas story through words and song. This is a family service where children and adults will participate together.